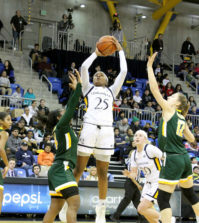 “We were down two at halftime, and in the second half Monmouth really came out and dominated,” head coach Tricia Fabbri said of the season-ending game. Despite the heartbreak ending to a season that saw the Bobcats go 11-7 in the NEC and 14-16 overall, expectations are high for the veteran leaders and six new recruits as they face a difficult schedule. The schedule, including a rematch against Monmouth Feb. 4, a trip to the west coast to take on Saint Mary’s, and a face-off against Minnesota out of the Big Ten present immediate and obvious challenges, but Fabbri also noted a more personal match up. As the Bobcats prepare to fight for redemption this season, they have welcomed a luxury that has been a struggle in the past: depth in the lineup. This interchangeable roster is largely in part of the talented recruitment class who will soon make its debut. Added to the roster are Gillian “Boo” Abshire from Washington D.C. and Shaina Earle from Blair Academy in New Jersey, both point guards. 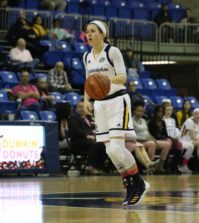 Although the Bobcats lost four seniors, including All-NEC First Team player Courtney Kaminski, and Jacki Mann, who elected not to return and graduate this upcoming December, the rest of the veterans are hardly going unnoticed. 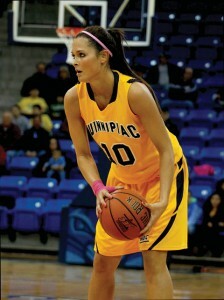 Returning starters include Jacinda Dunbar, Kari Goodchild and Felicia Barron, along with Shelby Sferra and Lisa Lebak. “We have a nice combination of players who played meaningful minutes for us last year who are a year older now and six young freshmen who are really highly touted recruits,” Fabbri said. 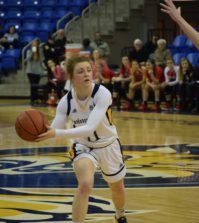 With no lack of confidence heading out onto the court, the Bobcats have managed to remain grounded by setting reasonable expectations as the season opens. Even though the season has yet to begin, it is clear that it is not too early to begin thinking about the future, particularly as Fabbri, entering her 17th season at the school, just signed a contract extension this summer, keeping her at Quinnipiac through the 2015-2016 season. The Bobcats open up their season at home against James Madison University on Nov. 11 at 4 p.m.
Felicia Barron (Sr., G) – A senior out of Springfield, Mass., Barron was a key contributor to the team’s success last season. Barron is the team’s highest returning scorer, averaging 11.5 points per game last year and also led the team in assists with 118 (3.93 per game), good for fourth in the NEC. Barron also plays a tenacious defense, leading the team with 63 steals last year.